Exxon Mobil Corp. figures the cost to clean up a July 1 oil spill into the Yellowstone River in Montana will be $42.6 million. The company’s emergency response to the spill from the Silvertip pipeline will cost $40 million and property claims will be $2.5 million, the company said in a July 29 filing with the Transportation Department’s Pipeline and Hazardous Materials Safety Administration. Exxon also lost about $100,000 of oil and other commodities in the spill, according to the federal document. Exxon’s 69-mile (111-kilometer) Silvertip line spilled an estimated 1,000 barrels of crude into a flood-swollen Yellowstone River near Laurel, MT. The pipeline runs from Elk Basin, WY to Exxon’s refinery in Billings, MT. More than 1,000 people were working to clean up the site as of Aug. 12, according to the U.S. Environmental Protection Agency, which is leading the response effort. Sampling results for air, water, soil and sediment around the river show “no levels of concern” for water supplies or air quality, the agency said. 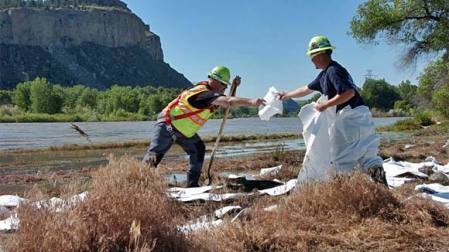 Workers continue cleaning up Yellowstone River. Officials estimate clean up will continue well into November.